We make no attempt to identify you individually unless you supply personal information for one of the limited purposes listed above. We track aggregate usage data to help us improve site content and organization. The policy details section below specifies the information we collect and how we use it. The information collected allows us to see trends in usage: the most commonly viewed pages, what sites link to the MARTA site, and information on the browsers used to view the site. Cookies are small files that can be placed on your computer by Web servers when you visit a site. These files may contain information such as ID's and passwords, personal information or preferences. During your visit, the server can access these files to help personalize pages. MARTA does not set cookies from any page in the itsmarta.com domain that store personally identifiable information. The Trip Planner can store your travel to and travel from locations if you desire (and this only occurs if you elect to set cookies by checking the "Remember" checkbox). In this scenario, the only cookies saved will be your "Travel From" and "Travel To" locations, so that next time they will already be filled in for your convenience. Our e-commerce and vendor registration sites set cookies with login information, but only for the convenience of customers who use these areas repeatedly. If you are concerned about privacy, you may set up your browser not to accept cookies or you can delete them from your hard drive once you leave the section. There are places on the website where we ask you to provide us with personal information. We collect this information in order to provide you with the specified goods or services you requested. The information collected is owned by MARTA and will not be sold or given to any entity outside of MARTA except contractors hired by MARTA to provide MARTA-approved services. These contractors are bound by this policy and are prohibited from using the information except to fulfill the services for which MARTA has contracted. We are required to release personal information if it is subpoenaed by a court or grand jury. We may be required to provide personal information in response to a request under the Georgia Open Records Act, OCGA §50-18-70, et.seq., unless the information requested is exempt from disclosure under the Act. We may also provide statistics based on the information automatically collected from your visit to federal, state, and city officials. If you fill out an application for employment, the information collected will be used to determine whether you qualify for the job and for all other purposes related to your decision to seek employment at MARTA. We provide links to other web sites. If you follow these links, you are leaving the MARTA site and are subject to the privacy policies of those sites. Note that the links we provide to outside sites are offered for your convenience. MARTA takes no responsibility for outside sites' content or policies. 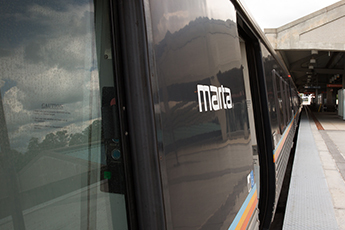 Certain images and all text on the MARTA website are copyrighted by MARTA and are protected by applicable laws. Anyone wishing to use MARTA graphics such as our logo or banners should contact MARTA to obtain a license or permit. MARTA reserves the right to make changes, additions or deletions to this policy as needed. Changes will be posted to this site. While we attempt to maintain accurate and current information on our web sites, MARTA does not warrant the accuracy or completeness of any material displayed on its web sites or on any links accessed from its web sites. MARTA updates its web sites periodically, and may change any of the material at any time without notice. The materials posted may become out of date, and MARTA makes no commitment to update the materials. It is suggested that Customers call the MARTA Customer Information Center at 404-848-5000 for assistance.